Free VPN Investigation: Who Is Behind the Most Popular Free VPNs? It’s therefore vitally important that consumers choose their VPN provider wisely given the potential for misuse of their data. Unfortunately, the majority of apps appearing in the top results for “VPN” searches are free products from obscure and highly secretive companies that deliberately make it very difficult for consumers to find out anything about them. [Note that whenever we refer to “free” in this report we mean ‘gratis’ or provided without charge. These apps are not “free” software as in the sense of “freedom”, such as open source software]. Update: As a follow-up to this investigation, we have since published the Free VPN Risk Index. This technical analysis of the most popular 150 free VPN apps on Google Play revealed significant privacy flaws. Based on these combined findings we recommend consumers strongly consider paid-for VPN services or at the very least research independent free VPN recommendations. 64% of apps had no dedicated website – several had no online presence beyond app store listings. Vast majority of companies make it very difficult to find out where they are based and who is involved – for a minority it was impossible to track down the provider. The below table lists every VPN app we investigated. Click the app name to jump to its detailed findings. Android install numbers are total installs worldwide, iOS are estimated monthly with all data from Sensortower. Company Name: Innovative Connecting Pte. Ltd – named developer on Play Store listings and VPN Master website. Turbo VPN listing also links to the same website. While the exact nature of the relationship between these three companies remains unconfirmed, they are clearly associated. ALL Connected is named as developer of VPN Master and Turbo VPN on the App Store, while Innovative Connection appears on the same apps’ Play Store listings and on the VPN Proxy Master website that links to both stores and is linked to from the Turbo VPN Play Store listing. Lemon Clove shares a company secretary and key addresses with Innovative Connecting. Furthermore, the privacy policies for the two versions of VPN Master app are identical yet hosted on different domains, one of which is on the ALL Connected domain, the other on a generic Cloudfront domain. The policy for both versions of the Turbo VPN app is hosted on the same generic Cloudfront domain as VPN Master but on a different URL (see below for more info). Similarly, the Snap VPN app from Lemon Clove is also on the same Cloudfront domain and shares the same wording, including notable typos. Innovative Connecting director Chen Danian (aka Danny Chen) is a notable and influential Chinese internet entrepreneur and has previously been listed among the 400 richest Chinese. He is founder and CEO of Linksure, which shares a name with the single shareholder of Innovative Connecting. While his name has not been previously publicly linked with this VPN company, he is listed as director on Singapore’s Accounting and Corporate Regulatory Authority (ACRA) Business Profile of the shareholding entity. Company secretary Yoo Loo Ping for Lemon Clove and Innovative Connecting is a Chinese passport holder. ALL Connected director C.K Vishwakarma is a Singapore-based Indian management consultant involved in an array of ventures related to the Internet of Things, big data and blockchain with no mention of VPN or digital privacy on his profiles. British Virgin Island-based Lemon Seed Investment has no online presence beyond its appearance on Lemon Clove’s business registration documentation as sole shareholder in the company. The privacy policies for the three apps are identical aside from reference to the app name. The single biggest issue is that the policy allows for user data to be transferred to China. Requests to clarify the justification for this policy along with copies of the aforementioned contractual clauses went unanswered. The data we collect can include SDK/API/JS code version, browser, Internet service provider, IP address, platform, timestamp, application identifier, application version, application distribution channel, independent device identifier, iOS ad identifier (IDFA), Android ad master identifier, International Mobile Subscriber Identification Number(IMSI), iOS network card (MAC) address, and iOS international mobile device identification code (IMEI) The equipment model, email address, the terminal manufacturer, the terminal device operating system version, the session start / stop time, the location of the language, the time zone and the network state (WiFi and so on), the hard disk, the CPU, and the battery use, etc. Missing from the policy were the standard elements that constitute more typical VPN privacy policies, ie specification of connection metadata collection, storage and disposal, and how the company responds to DMCA notices. These policies fell far short of what we would expect from a mainstream VPN and we would recommend consumers avoid these apps. Note the Gmail addresses, which is unheard of with professional companies. We did not receive a response by the time of publication. Read our full reviews of VPN Proxy Master, Turbo VPN and Snap VPN. One of many free VPN app companies based in Hong Kong with Chinese ownership. Both director Li Jin and sole shareholder Chengdu Zhuozhuo Technology Co are based in the Sichuan province of China. Free Connected was incorporated in July 2017. Chengdu Zhuozhuo Technology Co is a gaming technology company. The policy is hosted on the company’s domain, which is a plus. One of the more professional and transparent privacy policies we examined as part of this investigation but still far from best-in-class. It’s not 100% clear from the policy documents exactly what data points are collected to verify individual users as part of VPN connection metadata logging. Support was prompt and professional and clarified the policy regarding VPN connection metadata logging. For your information, we do not collect the users’ original IP address and the server IP address that the users connect to. Our system does assign each user a unique user ID, which is for verification purpose(e.g. If a user made a purchase via App store and does not have an account with us, we’d use the user ID to verify the subscription and provide further assistance). Having said that, it serves the purpose of user verficiation(user support) (sic) that would be considered as account data. As for all other VPN connection data, our system will automatically delete them after 96 hours. Read our full X-VPN Free review. Director and sole shareholder Zhang, Rui has 44 directorships on record, of which 30 remain active. One of many free VPN app companies based in Hong Kong with Chinese ownership. It was incorporated in June 2011. The policy itself lacks important details, with a substantially greater focus on what a user must not do while using the VPN service rather than what the VPN provider will do to protect their privacy. We do not log any user activity (sites visited, DNS lookups, emails etc.) We only log access attempts to our servers (for security and troubleshooting). We do not get involved in any form of censorship. We do not give your personal info to any third parties. We do not cooperate with any requests for information unless we are ordered by a court of competent jurisdiction and the vast majority of these requests would not be from a court of competent jurisdiction We will protect you to the max and our system is setup to automatically do so. There are hundreds of good reasons for being anonymous and we respect them fully. Missing from the policy were the standard elements that constitute more typical VPN privacy policies, ie specification of connection metadata collection, storage and disposal; protections should the authorities seek user information; or measures to ensure that troubleshooting data is actually deleted. Despite using a popular customer support platform (Zendesk), that automatically responds to support requests and issues a ticket, Infinity Software did not respond to our requests for clarification of the following beyond the initial acknowledgement of our email. Read our full VPN 360 review. Company Registration No. Unconfirmed as Chinese language company name required. There is very little information available about this company. However, it’s very interesting that a VPN company would be based in a high-profile Beijing technology park, described as an “innovation incubator” given the aggressive ban on VPNs in China currently. The Terms of Service are identical to the document used by VPN 360, simply replacing any mention of “VPN 360” with “VPN”. The same issues therefore apply. Most critically, there is no detailed policy on connection metadata logging, retention and deletion – data that can potentially be used to identify users in certain circumstances. Free VPN, LLC is clearly associated with ActMobile Networks, Inc as the latter is named as the Manager of the company on the Statement of Information filed for Free VPN, LLC. The two companies share the same California address and ActMobile Networks, Inc. Manager Timothy Bush is named as the agent for service of process on a certificate of conversion filed in 2016 for Free VPN, LLC. Act Mobile makes no reference to Free VPN by Free VPN.org on its website, however it does promote another service, Dash VPN. What are your policies regarding logging, as the policy mentions neither activity nor connection metadata policies. What data points do you collect? How long do you store them for? Do you own your own VPN servers or lease third-party servers? Similarly, DNS servers? If you rely on third-party networks, what protections are in place for users of your service? The only information we capture / log as of now is the amount of data consumed by the user. No other data is stored with us. We also do not associate the data to any physical device, instead use a key which cannot be easily tracked back to a physical device, keeping our service, truly anonymous and secure. When connected to the VPN you will remain anonymous to any website or online service that you access unless you are required to log into access their service. However, the browser can still keep records of your online activity & need to be configured to not keep track of your online activity. The device byte cache is created & maintained locally on your device to ensure optimal online performance when the VPN is connected and may require up to 250MB of space on your device storage. Uninstalling the app should revoke permissions required for establishing a VPN connection. On Android devices, all app data can be deleted from the device settings (Settings -> Apps – > FreeVPN -> Clear Data). The answer lacks the crucial detail around connection metadata that is required to be able to trust a service with personal data. Read our full Free VPN by FreeVPN.org review. Sapling Growth Tech does not appear to be a legal entity however. A single policy – dated June 2018 – applies to SecureVPN and HotspotVPN. The policy shares the majority of its text – typos included – with the policies of apps operated by ALL Connected and Innovative Connecting, ie VPN Master, TurboVPN and SnapVPN. Our business may require us to transfer your Personal Data to countries outside of the European Economic Area (“EEA”), including to countries such as the People’s Republic of China or Singapore. The policy for VPN – Master Proxy is dated May 2015 and does not refer to that app by name, instead specifying Easy VPN and HotspotVPN. The policy itself is identical to that of VPN 360 and has all the same serious issues. Refer to that section of our report for full details. As with those VPNs, we would recommend consumers avoid these apps also based on these deeply worrying policies. Our requests for clarification around connection metadata policies and the transfer of data to China were ignored. Hong Kong with links to mainland China. Company Name: Tengzhan Hongkong Limited (騰展香港有限公司) – operates as Dingtone outside China. The corporate structure here is highly opaque. The company behind SkyVPN refers to itself variously SkyVPN Inc, Secure Sentry Communications and Dingtone. Dingtone is named, albeit not prominently, as the “seller” on the App Store Listing (but not the Play Store listing). There is also a pending trademark application from Dingtone for “SkyVPN”. It would be very difficult for the average consumer to make the leap from Dingtone to The Tengzhan Group, which acquired the company in 2015, according to this Chinese language disclosure document as there is no other reference in English language media. Tengzhen Hong Kong Ltd incorporated in December of that year with You Xiumie as director and sole shareholder. Once you aware of the connection (and know the Chinese name of the parent company), it’s possible to confirm the ownership of the Dingtone brand – and by extension SkyVPN. While certainly more professional in appearance than the policies of most other China-linked VPN services, we noted instances of identical text with those services, down to idiosyncratic word choices. Overall it was slightly better than the likes of Master VPN, VPN 360 et al, the policy was still lacking much of the important detail consumers need to make the decision to trust a VPN service. While we noted with relief, no mention of data transfers to China, we were concerned with the lack of an explicit policy on the logging, storage and deletion of connection metadata (such as connecting IP addresses, timestamps etc). When you install SkyVPN on your device, we may automatically collect certain information from your device, including an Android, Apple iOS, or other ID, device maker and model, mobile web browser type and version, IP address, MAC address, the operating system’s maker and version, location information, MCC (Mobile Country Code) information, the mobile application name, a list of mobile applications installed on your device and other technical data about your device. Whether “aggregate bandwidth” refers to an individual or the entire network? If it’s the former, how is this tied back to an individual user? SkyVPN did not respond to our requests. Read our full SkyVPN review. This Hong Kong company has Chinese links via its director Wu Bin and its sole shareholder, Chinese-registered company Shenzhen Yituo Holdings Co. Wu Bin is also one of three shareholders in that company and the only natural person among them. IST MEDIA is a mobile app publishing company that helps domestic and overseas customers access global mobile phone users. And help customers to monetize the most efficient traffic. Our customers include 360, Baidu, apus, solo, UC (Ali Mobile), Mico (social app), etc. This does not suggest a company whose principle mission is to protect its users’ privacy and it’s of concern that this information is not easily available to current and potential users of Patron VPN. The presentation is more professional than most VPN services in this report, despite some typos, and the language is friendly and easy-to-understand. However, we were concerned at the lack of any detail relating to VPN metadata logging, retention and deletion, nor how they respond to copyright notices. We were also not reassured about the privacy of users’ IP addresses given that VPN Patron uses them to derive approximate location despite claiming “immediate obfuscation” takes place. When you launch VPN Patron, we also collect device-specific information, such as the hardware model, operating system version, browser type, language, wireless network, and mobile network information. This information does not identify you, and we use it to provide and improve the Services, and perform analytics on our services. Note the personal Gmail address, which is unheard of for professional companies. Why do you need to know user’s approximate locations to provide the service? VPN connection metadata logging, storage and deletion policy. We did not receive a response to our email requests by the time of publication. Braincraft is a generalist app developer whose portfolio includes: Face Swap, Mirror Reflection, Audio Mixer, Add text to Photos. These are all basic, throwaway apps, underlining that this is not a privacy-focused company. They did not respond to our email requests. Another Hong Kong-registered VPN with links to mainland China via its director and sole shareholder Dong Hang, whose Chinese passport and Guangzhou address are a matter of public record. This is an extremely opaque VPN provider in that it has chosen an apparently arbitrary name for the app store listings “Sarah Hawken” with no obvious links to a legal entity behind it. However we discovered a customer support link on an iTunes listing that led to a dead page on the company’s otherwise still active domain. Yolo Net Technology describe themselves as “focusing on developing small and beautiful mobile applications”, however there is no mention of YogaVPN on their website. The policy itself is worthless to a VPN user – the only mention of VPN is in the YogaVPN email address at the bottom. There is no information whatsoever about how user privacy is protected and the entire policy appears to be generic boilerplate text that could apply to any website. We would recommend consumers absolutely avoid using a VPN with such a lack of focus on privacy and transparency about its practices. The VPN connection data logging, storage and deletion policy. Whether they had any VPN-specific privacy policies they could share. Read our full Yoga VPN review. Note: sole shareholder in that company is another Chinese company Sichuan Xunyou Network Technology Co., Ltd. (四川迅游网络科技股份有限公司) with USCC: 915101006771884972A. LionMobi director Lu Jin is a majority shareholder in this company also. VPN Guru is completely opaque and was the most difficult app to investigate. Its app store listings name “Chi Zhang” as the developer/seller, however this is not a legal entity. It offers a number of apps, including the popular hotspot scanner app WiFi Anywhere. However, it has no website and privacy policies are hosted anonymously. We were able to track down the company via these policy documents however. They are hosted in the cloud on Amazon servers in a folder called “commonfiles” registered by the developer, along with policy documents for its other apps. Further confirmation of this connection between VPN Guru and LionMobi can be found in the fact that an individual called Songtao Bai works or worked at LionMobi. Songtao Bai was named on the listing page for the meditation app that also contained reference to the zhangchi0563@yahoo.com email as a contact. LionMobi Holding Ltd is registered in Hong Kong, however its sole shareholder is based in Chengdu, China. One of its directors Lu Jin is the majority shareholder in that Chinese company Chengdu Lions Technology Ltd. Note the privacy policies are hosted on standalone Amazon S3 buckets – a very rough-and-ready approach that lacks transparency, as there is no parent domain with information about the company. The terms document does at least contain reference to VPN. However, it’s very short and lacks detail. It is almost all boilerplate text shared with other VPNs in this investigation, such as VPN 360. It therefore shares the same issues, most critically a lack of any sort of detailed policy on connection metadata logging, retention and storage. Hola is a VC-capital backed private company in Israel that has raised a total of $24M over two rounds of funding, the last being in September 2015. Hola is a peer-to-peer VPN network and has provoked controversy with its business model, which is based on selling its users’ bandwidth, and other security flaws. Hola VPN may be free but it comes at a very real cost to user privacy in several different ways. 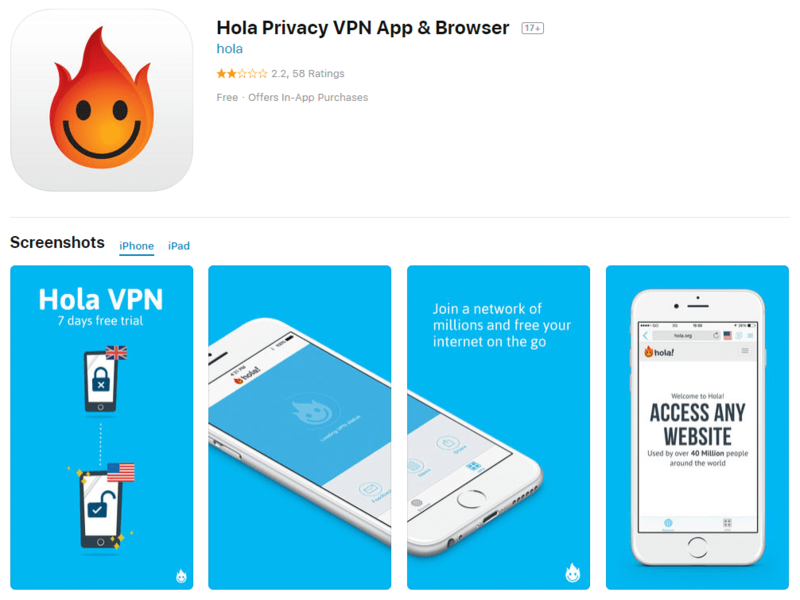 The policy is at least explicit in how Hola compromises its users’ privacy. Log data may include the following information- browser type, web pages you visit, time spent on those pages, access times and dates. Worse, data retention is at their discretion. The next red flag is that, uniquely, Hola VPN is a P2P VPN network, ie when you connect to US “server”, you are connecting via an actual US Hola user’s IP address. Other users will also be routed via your IP address. This means potentially nefarious activity could take place on your IP and you wouldn’t even know it. Read our full Hola Free review. AnchorFree, Inc. may own all three of Hotspot Shield, Betternet and TouchVPN, however it is not very transparent about owning the latter two brands, with no mention of them at all on its corporate site. CEO David Gorodyansky has been at the helm since co-founding the company with Eugene Malobrodsky in 2005. AnchorFree Inc. found itself at the center of a privacy controversy in 2017 when the Center for Democracy and Technology filed a complaint to the Federal Trade Commission, alleging that the company misled its users about privacy issues relating to advertising in its free version of Hotspot Shield VPN. Although AnchorFree Inc. firmly refuted the allegations, it has since made significant improvements to its Hotspot Shield privacy policies. The company also committed to publishing an annual transparency report to reassure users about how it deals with requests for user data from the authorities. These two apps share the same policy, both are professionally hosted and formatted, and were recently updated at the end of June of this year, which creates a strong first impression. Overall the policies are very good and take great pains to explain everything as clearly as possible. A minor gripe is that users of the free version of the app have their city-level location shared with with advertisers. However, the average consumer is unlikely to be too concerned about this. When you are connected to the Hotspot Shield VPN, advertisers are prevented from seeing your IP address, however if you are using the free version of Hotspot Shield we may share this approximate (city-level) location. In boths sets of terms, it states that AnchorFree Inc responds to notices of alleged copyright infringements that company with the Digital Millennium Copyright Act (as you would expect from a US-based company) and in the DMCA notification policy, it talks about cutting off repeat offenders. There is an apparent contradiction between this policy and their stated policy of not storing users’ originating IP addresses beyond the session. Our VPN product will never store or log your IP address beyond the duration of your VPN session, and we always delete your IP address after you disconnect from the VPN. Overall while the privacy policies aren’t quite as strong as comprehensive as the leading commercial VPN services, they easily surpass the minimum standards for privacy and transparency we expect from major VPN providers. This policy, on the other hand, has not been updated since 2015 and contained outdated references to “Northghost” as the VPN provider rather than TouchVPN or AnchorFree Inc. It is also not formatted to be as readable as the other two policies, making it feel neglected and not particularly reassuring for users. Aside from the show-stopping red flag of referring to a defunct entity, Northghost, rendering the policy invalid, another major issue is that this VPN logs user activity, although they do claim its anonymized. Log Data is a data that is automatically recorded by our servers when you use the Services. Log Data may include information about your device such as your IP address, browser type, the webpages you visit, the time spent on those pages, access times and dates, unique identifier that was generated for your device (if you use the Services from your mobile device then such identifier may be you mobile number). Such data is used by us in its aggregated form and is not combined with any Personal Information. This is unheard of among reputable VPN services. Considering the other issues we have with this policy, TouchVPN falls short of what we would expect in this area. AnchorFree does not offer email support for users of the free versions of Hotspot Shield and Betternet. TouchVPN only offers the outdated support@northghost.com, which doesn’t appeared to be monitored. Read our full reviews of Betternet Free and Hotspot Shield Free. Over the course of this investigation, Chinese company Wuxi Jiubang Information Technology Co has sought to obscure its ownership of Shield VPN, replacing reference to it on the App Store listing with “Flare Internet Ltd”. This is a brand new company incorporated in the UK on July 30 with Shanghai resident Xu Peng as its director and secretary. The relationship between the two companies is unclear. We also noted that the footer of the Shield VPN website has been updated to Flare Internet Ltd rather than Luo Chengju, as it was up until early October. However, it suggests the Flare Internet’s copyright to the website design and content dates from 2017, despite the company not existing at that point. Note that Wuxi Jiubang Technology Co Ltd is an alternative transliteration of the Chinese 无锡久邦信息科技有限公司 to the romanized Wujiubang Technology Co Ltd that featured on the original app listings. While the policies are at least hosted on a proper website, they are poorly written (even containing typos) and lack detail. Shield VPN does not collect, log, store, share any identifiable personal information of Users. Shield VPN may collect the connection times to our Service and the total amount of data transferred per day. Shield VPN stores this to be able to deliver the best possible network experience to you. By using Shield VPN you acknowledge and consent that Shield VPN may display advertisement within the App, as a separate webpage in your browser, or in any manner that Shield VPN finds suitable. Shield VPN may use third party advertisement services with their own terms and conditions. By using Shield VPN you also agree the terms and conditions of those third party services and acknowledge and adhere that Shield VPN shall not take any responsibility nor liability for the contents shown on their behalf. While significantly better than many policies covered in this investigation, it still falls short of what we would expect from commercial VPN services. Wyoming LLCs are not required to file any personally identifying information about owners or managers. This VPN provider has taken advantage of this to keep its company structure secret. When asked about where they were based, the company declined to confirm this information. Beyond the Wyoming state registration documents, Ever Fun Apps LLC has no online footprint beyond an extremely shoddy free WordPress site and mention in the small print of its VPN website. The hosting of the policy on a proper website is the only positive of this highly disturbing document. This VPN logs all user activity without even any attempt to anonymize this highly sensitive data. – details about how you’ve used our services. – device information, such as your web browser type and language. – identifiers associated with cookies or other technologies that may uniquely identify your device or browser. This absolutely shocking and goes completely against the spirit of using a VPN. It goes without saying that this is far from acceptable and consumers should avoid this VPN at all costs. This Chinese company was established very recently in April 2018. It would be very difficult for the average consumer to find out anything about the company as the English-language corporate website has no information at all about the company, nor any reference to Victory VPN. It doesn’t help that there is no reference to the Chinese company name on the site, which required to search the public record in China. Similarly, the fact that the Chinese name is not a straight translation or transliteration of the English name. Chairman and General Manager He Xin is the sole natural person of the two shareholders, the other being a Chinese private equity fund. The support form is a little ridiculous in that it does not even contain an email field so that they can respond to queries. Despite including a return email in the text, we received no response to our queries about privacy safeguards. FengJie Yao is a ghost with no traceable online presence beyond an absurdly sparse personal Facebook page linked to from the App Store listing for Storm VPN. It’s irresponsible of Apple to allow into its store an app from such an opaque entity. Incredibly, there are no legal documents at all published for this VPN. It should go without saying that no-one should use this app as it stands. SuperSoft Tech has no website nor is it registered in Singapore despite the address published on the the Play Store listing (which is actually part of the National University of Singapore campus and therefore likely bogus). However, not only does the URL of the listing contains reference to Zheng’s name https://play.google.com/store/apps/details?hl=en&id=com.jrzheng.supervpnfree but a search against the goanalyticsapp@gmail.com email address leads to a Chinese-language listing page for the app that references Zheng’s full name. Another page for SuperVPN lists a Beijing address, which appears to be a 7days Inn hotel – potentially yet another fake address. While it’s not confirmed where Zheng, who has published several apps, has incorporated, on balance, based on the above, it’s likely that there is a China connection. The policy itself is hosted on a user-unfriendly URL that does not inspire trust. The policy itself is so short and lacking critical detail that it’s close to worthless. It is written in very poor and occasionally nonsensical English and lacks any detail at all about how user privacy is safeguarded. This extremely amateurish policy is nowhere near the minimum standard we would expect from a professional product. VPN connection data logging, storage and deletion policy. Read our full SuperVPN review. Vladyslav Minaev filed a trademark application for “VPN Private” against the same Dnipro address on the Play Store listing. We also received email correspondence from someone of the same name. Minaev told us that VPN Private deliberately obscured details of the Ukraine company for security purposes. While the policy is at least hosted on a basic website, it is very short and lacking detail. There is not enough detail about VPN connection metadata logging, retention and deletion to reassure potential users. The App may gather the information about the time duration of connections to our servers and the total amount of data transferred per day with the sole purpose of providing you with our awesome network experience. Worryingly, there is little further policy detail beyond the above, which means this is yet another free VPN with substandard privacy protections. We collect: connection time, bandwidth, speed. 1.1 We confirm that this information is collected anonymously and is not in any way tied to the individual users. VPN Private is located in Ukraine. 2.1 For security purposes we do not share the information about the company itself, since the less is known about the company, the more our users are protected. The company confirmed that the US address is for payment purposes only and that Signal Lab are “independent developers from Hong Kong”. However there are no companies called Signal Lab or similar currently registered in Hong Kong. In addition, when you use our app we may collect the following information: IP address, Internet service provider, OS version, language of the device, app identifier, app version, independent deice [sic] identifier, ad identifier, devide [sic] manufacturer and model, email address, the time zone and the network state (WiFi and so on), times when connected to our service, choice of server location, and the total amount of data transferred per day, etc. We store this to be able to deliver the best possible network experience to you. We analyze this information generically and keep the data secure. We do not log personal activities such as user data traffic or browsing history. In order to improve the quality of our service, when the user connects to the VPN, we will log the user’s IP, target server IP, connection duration, bytes used, etc., and keep it for one month for analysis. Session data will only be stored on our servers and will not be shared with any third parties. In addition, our app uses third-party statistical SDK such as Flurry to help us improve the app. These SDK will collect some common information, such as mobile phone system version, language, app version, device model, etc., does not contain personally identifying information. The US address we provide is for payment purposes. We are not a company registered in the United States. Read our full Thunder VPN review. Fruit Security Studio relaunched VPN Melon under the new company name of “Free Vpn Proxy” on October 11 2018. The Google cached version of the original Melon VPN Play Store listing shows that they are are the same app based on the screenshots of the distinctive UI. Prior to the relaunch, total installs were at 1,000,000+ at 200,000 new installs per month. It has since reset to 10,000. Neither company name has any online footprint or feature in databases of registered companies, suggesting they are not legal entities. We noted that the listing featured a spurious address as the 15235 zip code does not match San Jose, CA. It’s striking that Google permits this kind of inaccuracy on listings. We would recommend consumers absolutely avoid using this VPN that has somehow managed to remove what scant privacy protections it previously had with its recent relaunch. Note the personal Gmail addresses, which is unheard of for professional companies. We received no response from either address. The Singapore address on the Google Play listing is actually a foreign workers’ dormitory, buildings notorious for poor living conditions and not a likely corporate HQ. We noted the Play Store listing URL referenced cheng cheng and a search revealed third-party listings for Super VPN that still listed cheng cheng as the developer. One of these listings led us to an old developer site, which then led us to Chinese-language pages featuring the Guangzhou address. However, we’ve decided not to dox what may be an independent developer in China given the current legal status of VPN in the country. Note that the policy is hosted on IP address URL that’s via cloud service LINODE so as to be not traceable. We will record some usage data for handle DMCA complaint. This usage data may include such information as the date and time of your login and bandwidth your usage. We will record your installed app information, only for handling DMCA complaints. If we receive a DCMA complaint, we will analyze installed app information of the abuser so that we can block all applications that may cause DMCA complaints. The open-ended nature of these clauses sets of alarm bells due to the potential for abuse. In fact, the policy omits far more than it covers. We would therefore recommend against using a VPN with such a policy. We received no response as the email address is disabled according to Gmail. Company Name: Apalon Apps – owned by IAC Search & Media, Inc.
Apalon Apps is based in Belarus but is owned by IAC, the US giant that owns Tinder, Vimeo, Ask.com and many other brands. This means that users of #VPN come under US jurisdiction, which considered highly privacy-unfriendly. The policy is multi-purpose as it covers all the apps published by Apalon, so it’s not 100% clear what applies to VPN, although VPN-specific terms are clearly marked. Apalon use third-party VPN providers but does not identify them (ie they don’t have their own servers). Despite these qualms, the policy does meet minimum requirements given its level of detail and transparency that permits users to make a reasonably-informed choice. We were disappointed at the lack of email support given the level of backing that the developer has. We were also greatly surprised to receive no response to our queries about their DMCA policy via the contact form. Read our full #VPN review. Private Canadian company incorporated in February 2007. While the policy is reasonably solid overall, we did have some concerns. We were not entirely comfortable with the logging of domain names even with the measures taken to de-link this information from individuals. Psiphon does not inspect or record full URLs (only domain names), and does not further inspect your data. Psiphon does not modify your data as it passes through the VPN. Even this coarse data would be difficult to link back to you, since we immediately convert your IP address to geographical info and then discard the IP. Nor is any other identifying information stored. We were also not comfortable with what appears to be a business model based on selling user behavior data – even if it is aggregated, as claimed. We collect the following data to find out how well Psiphon is working, what sites are popular, and what propagation strategies are effective. This information is shared with our partners so that they can see, for example, how often their sites are visited through Psiphon and from which countries. Nevertheless we do give credit for transparency here as it allows users to decide whether they are happy with this aggregated data collection in return for a free product. Psiphon disputed that they sold aggregated use behavior data. We have requested further clarification on this issue and will update this report again as necessary. Read our full Psiphon review. Methodology: We recorded the top 20 free apps displayed in the search results for “VPN” in the App Store and Play Store for UK and US locales. The app stores customize their search results based on locale, meaning we could have had up to 80 apps forming four lists of 20. We excluded a very small number of paid apps that appeared in these search results, replacing them with next app in the results. Since there is significant overlap between these sets of search results (ie each app appeared between one and four times) and because we excluded paid apps, the total number of individual apps appearing in these sets of search results was 30. We investigated the following: company ownership, country of incorporation, location of corporate HQ, privacy policies and customer support. All company information was verified via records from the appropriate official company registration databases. App install numbers are taken from Sensortower.com. Privacy policies and customer support emails were taken from links on the app store listings. We emailed customer support from our official top10vpn.com address and did not hide our true identity. We redacted full address details of individuals in order to avoid any potential repercussions against those individuals. The full addresses are contained however within the supporting documentation that is available on request. For more original privacy and security research, take a look at our Dark Web Market Price Index 2019, Free VPN Risk Index, or our analysis of dark web hacking tools.